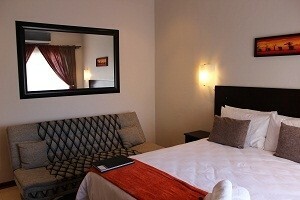 Magnificent upmarket accommodation with friendly and helpful staff. Meals provided. Personalized care is given to guests to ensure your comfort and happiness. We invite you to enjoy the hospitality of this distinctly different family run guest house, with your hosts Kresen & Adila. Staying at the Big Five Guest House is more than just surrounding yourself with luxury accommodation, the stunning African decor and the ambiance...it has the added bonus of being able to enjoy Mthatha's many attractions. Corporate guests will find us ideally positioned and in easy reach of businesses and events. The Big Five Guest House offers personalized service, impeccable attention to detail, great value for money and a distinctive quality experience. The traditional African decor abounds throughout, allowing guests to relax in comfortable surroundings while still having access to all of life's modern needs. 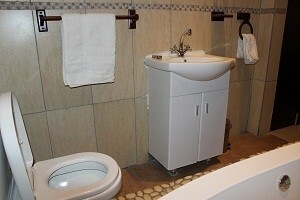 Big Five Guest House offers complete privacy and relaxation for the tourist or business traveler. It is in easy reach of the CBD, Shopping Malls, Sports Stadiums & Facilities, Nelson Mandela Museum, and other major tourist attractions. Enjoy a Full English Breakfast in our dining room or lovely sundeck, or feel free to make use of our modern fully equipped kitchen for your self catering needs. Snack platters, packed lunches and dinner can be arranged at reception. A mini tuck shop and alcoholic beverages are also available for our guests.